The discovery of radiation was also the impetus for finding ways to protect individuals who work with it from its harmful effects. Several years after Marie and Pierre Curie first discovered radioactivity, scientists started looking for ways to measure radiation exposure. Rome Wagner, a Chicago manufacturer of X-ray tubes, spoke in 1907 about trying to protect himself from accidental exposures by carrying a photographic plate in his pocket. At the end of each day, he would develop the film to see whether he had been exposed to radiation. During World War II, physicist Ernest Wollan and his team — who worked at the Metallurgical Laboratory at the University of Chicago, one of the sites for the Manhattan Project — developed the film dosimetry badge, which recorded exposure over days or weeks. He developed it to be attached to the back of a badge so that workers would be more likely to wear it every day. His team observed the darkening of the film, which was an indicator of radiation exposure, and they developed a method of measuring the amount by using a spectrometer. Over the next few decades, researchers continued to refine the method by which they measured the film’s darkening and, by extension, an individual’s radiation exposure. However, traditional processing of dosimeter badges is a time intensive process offering delayed results, which are often received too late to proactively act upon. 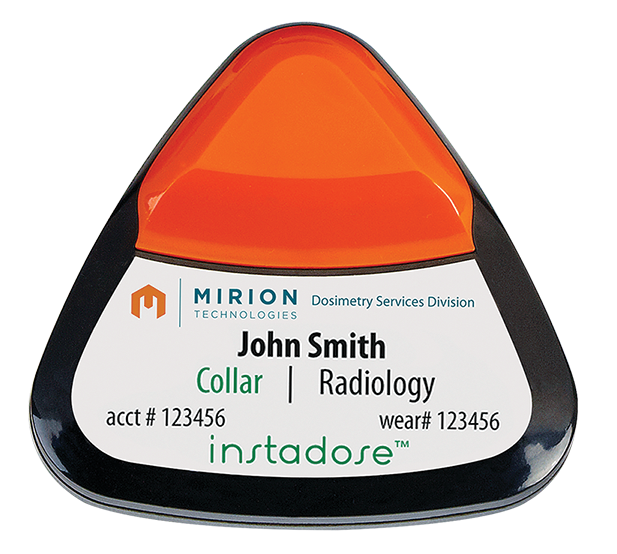 Mirion Technologies has revolutionized the industry by creating the Instadose+ digital dosimeter—a smarter, more precise monitoring solution. Instead of using film to measure radiation exposure, the Instadose+ digital dosimeter is based on proprietary direct ion storage technology. Each badge has a built-in memory chip that stores the wearer’s unique identity and wirelessly transmits dose data. Exposure levels and records can be assessed in real-time using a computer or mobile device. It’s a smarter way to keep track of ionizing radiation exposure. From a photographic plate carried in the pocket to a tiny digital device, dosimetry has radically evolved over the past 100 years. Today, people who work with and around radiation can have peace of mind with on-demand radiation exposure results that allow them to mitigate their exposure risk.